There is a trick few will tell you about but we KNOW it works. View a litter of Pug puppies in their home surroundings, with their mother. The chances are that the puppies by this time will be in a pen of their own. Step into the pen. If you are looking for the RIGHT puppy for you, ignore the way each individual puppy looks. (Of course if you are looking for a show dog, this will not apply. You will need to use a different set of criteria for choosing your pup. This works on the assumption that you are looking for a family pet or companion dog. It also works on the assumption that there are a number of pups for you to choose from, or rather, from which one can choose you!). Some will have larger paws than others, some will have different markings than others. Some might look prettier than others – which of course is no guarantee that they will not change as they mature. Ignore all that. What you are interested in is how your potential puppy reacts to you. Pick each puppy up one at a time. Fondle it, cuddle it, make a big fuss of it. Then put it down and walk away from it. Anything happen? Did it follow you? Did it continue to look at you, or did it go back to playing with the rest of its siblings? Work your way through the litter carrying out the same procedure and noting the reactions of each one in turn. If nothing out of the ordinary happened, try it over again. Was there any reaction from one that was different from all the others? Did any degree of bonding take place? Did one of those Pug puppies choose you rather than you choosing it? We’ve not only seen this done, we’ve DONE IT ourselves, and we can say quite categorically that it works. If the behaviour of one of those pups was different from the rest, try it again. Pick it up. Cuddle it. Make a fuss of it. Put it down and walk away from it. Note what happens. Did it follow you? If it did, then that’s the pup for you. You might not have made the choice yourself, but your pup did, and that is so much better than it being the other way around. It means that that small pup has already recognised something in you that tells it that you are its master, you are leader of the pack, you are the one it would rather be with than anyone else. If your pup can ignore all the distractions from its siblings and surroundings at that early stage, you have bonded from the outset and made a true friend for life! You’ve decided you want a Pug puppy, so what comes next? To begin with, make sure you understand what Pugs are all about. Make sure you understand the heritage of the breed. The Pug is a member of the Toy Group of dogs. That is to say, it is a companion dog. It is a dog that wants and needs company, your company. It is a not a dog that will be happy left alone outside in the yard. 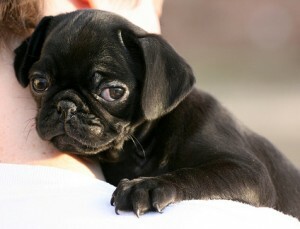 Buy your Pug only from a Kennel Club registered breeder. It is not to say that a non-registered Pug breeder cannot breed a perfectly healthy and happy Pug. It is not to say that a non-registered breeder cannot produce a dog that meets the Kennel Club breed standards when it comes to size and proportions etc. But by buying from a registered breeder you are buying a known and well documented history. You will know the history of your Pug’s parents and grandparents. You will know that they were happy, healthy, well-adjusted dogs so you can be fairly certain that your dog will turn out the same. It’s called genetics but really it’s all about buying a known quantity. The more you learn, the more you will ‘understand’ the breed. Buying a Pug puppy is a considerable investment, not simply in terms of the purchase price, but in terms of the cost of maintaining your dog throughout its life. So invest just a little money in a good book such as The Pug Handbook by Brenda Belmonte, and learn as much as you can about Pugs before ever you pick up your puppy. That small sum can yield huge dividends over the course of your dog’s life! Understand what potential health issues are inherent in Pugs. Every breed has potential health issues that are inherent to that particular breed. In the case of Pugs for example, hip dysplasia is a known issue. So check what hip score your puppy has and what score its mother has. Always insist on seeing your Pug puppy where it was born. View the surroundings it has known throughout its short life. Put yourself in your puppy’s place and ask yourself if you would be happy brought up in those surroundings. Then you can better decide if those surroundings are conducive to the development of a healthy and happy puppy. For example, is it clean, is it well maintained? Always insist on seeing your Pug puppy’s siblings, and particularly its mother. Does the whole litter look healthy and happy? Do they look clean and well cared for? Does the mother display the characteristics you are looking for in your puppy? We don’t just mean physical characteristics, but in terms of her temperament. Don’t just go on looks. How does she behave? Is she sociable? Does she behave the way you want your pup to behave? Check your Pug puppy’s current medical condition. Has it been wormed and when? When was it inoculated? Has it been treated for fleas? Has it been micro chipped? All Kennel Club registered dogs have 6 weeks free insurance included with their registration. Re-insure your pup as soon as possible by visiting Compare Dog Insurance. Heya, my name is Holly and I need help in which direction to go to make sure I have a pure breed pug without accidently buying from a puppy farm! I’ve never had a dog or pet before but was told that I can have one in the spring! arrrrr that isso lovely. I have a pug staffie cross, who is the most loving dog, and i am looking to have a pure pug in September. I cant wait !!!!! !